I launched this site with only one goal in mind. 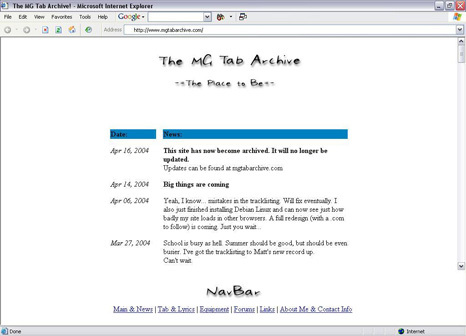 I wanted to have somewhere I could rely on to find tab for Matt's work whenever I needed it. I wanted the site to become a quick reference point for myself, and for anyone else who could use it. Over the past couple of years it seems to have become just that. 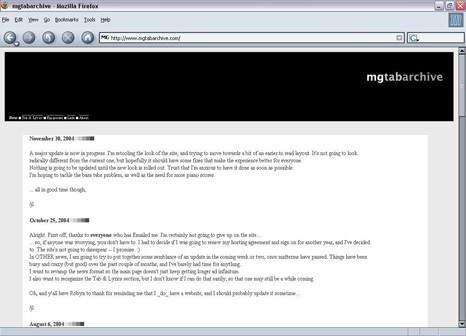 There are few places on the internet where you can find any of Matt's tab, and I can say without a doubt that nowhere comes close to this site. I've coded the site entirely by hand, and I've done my best to follow XHTML and CSS standards as best I could, so your experience should be for the most part trouble free. I test primarily in Firefox and IE for Windows, though, so I'm sure there will be problems. I'm a musician and a big Matt Good fan. I read music, and I read tab. I play a couple different instruments, and I write and record my own music. I'm also studying to be a Computer Engineer. I've been making websites for a while, but I eventually had to accept the fact that I wasn't all that good, so I had better pick a site that sells itself based on usefulness. I think I made an alright choice.